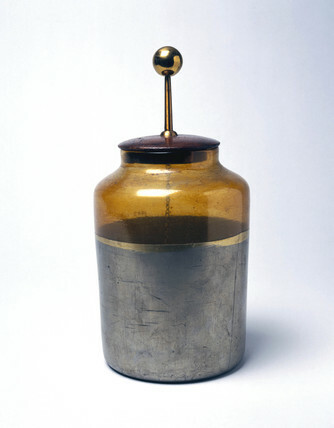 The Leyden jar was an early capacitor, or a device for storing an electric charge. It was devised in 1746 by Pieter van Muschenbroek, at Leyden in the Netherlands. It is simply a glas jar with metal foil coatings inside and out. The inner coating can be connected to a source electric charge by a chain or other conductor. When one end of a discharger is placed in contact with the outer foil, and the other end is brought near the ball on top of the charged jar, a spark pases between the ball and the discharger. 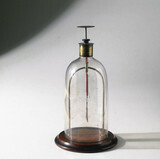 The Leyden jar is interesting because it produced much more powerful electric shocks, or sparks, than anything before it. An electrostatic machine with accesory apparatus, 1780. Wheatstone's portable ABC telegraph, 1858. Post Office 706 telephone, c 1959.